The Underwood Opera House is in the middle. George W. Underwood came to Hillsdale in 1843 from New England, a man whose sterling pedigree included four Revolutionary War soldiers. He was a druggist by trade, thereby earning the title of "Dr."
Dr. Underwood hitched his star to Hillsdale, building the first business block in the village. It was situated on the west side of Howell Street, to the north of Adam Howder's Hillsdale House. Theatrical entertainment was presented in Underwood Hall, and it was there that the Hillsdale County Agricultural Society was organized and planning for the first County Fair done. It was in the second business block of three stories that he built on Howell Street where Gelzer's Hardware now stands, that Dr. Underwood truly brought entertainment to Hillsdale. 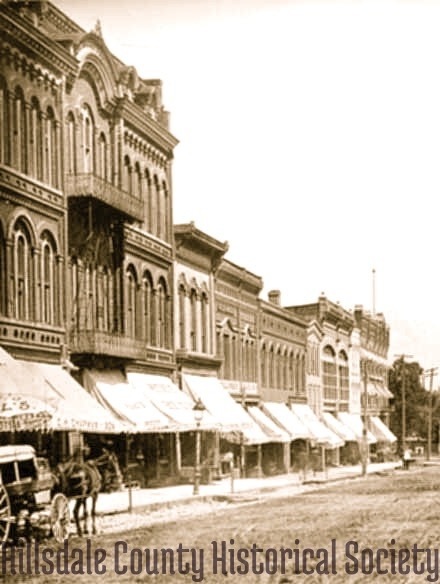 The block was opened for occupancy in 1869, the year Hillsdale was incorporated as a city, with Dr. Underwood voted the first mayor. The first floor had stores, including Dr. Underwood's, where he sold not only drugs but also paints, oils, groceries and surgical instruments. The second floor had offices, and the third floor was a marvelous opera house with a large stage, dressing rooms and a platform worked by levers that he had designed to move the Chickering piano, purchased in 1883, from the auditorium to the stage. Mrs. Underwood's inclination was to have only sober lectures and concerts. Dr. Underwood wanted (and got) the theatre: dramas, operas, melodramas and minstrel shows performed by traveling companies that stayed in Hillsdale's hotels and thrilled the locals who spotted the actors on the street. Movies eventually came to Hillsdale, supplanting the entertainment offered at the Underwood Opera House. In the 1950s the Hillsdale Daily News reported that the opera house was beyond repair. "Gas chandeliers hanging drunkenly from its water-stained ceiling, gaping holes in its darkened stage … " were the only things left from "… the gaslight and garter era in Hillsdale." G.C. Murphy Company, which owned the building, removed the third floor, leaving only a memory of a bygone time.